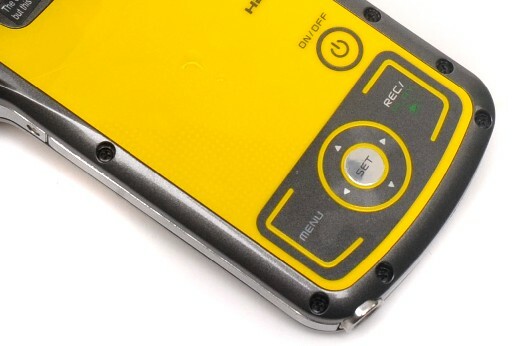 The Sanyo Xacti VPC-CA100 is a great option for anyone who requires underwater Full HD videos. Despite some minor design flaws, it remains an excellent all-round performer. After one of the coldest winters in living memory, followed by a wet and dreary beginning to summer, the prospect of hitting the beach for some underwater videography might not sound too enticing. But if you do decide to take the plunge, it's hard to look past the Sanyo Xacti VPC-CA100. 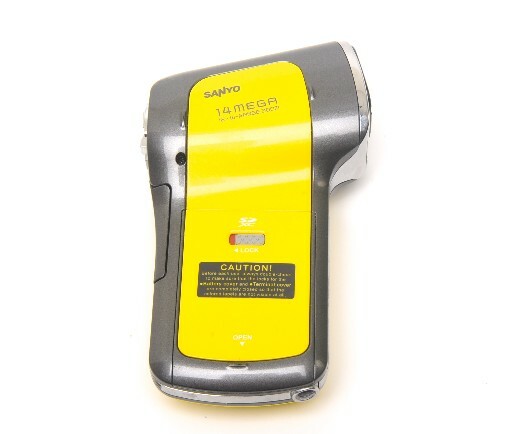 The Sanyo Xacti VPC-CA100 (AKA Sanyo Xacti VPC-CA100TAYL/Sanyo Xacti DMX-CA100) is a flash memory-based camcorder that is waterproof to a depth of three metres. It records video in the MPEG-4 AVC/H.264 format to SDHC/SDXC memory cards. Boasting a 14-megapixel CMOS sensor and Full HD recording capabilities, the VPC-CA100 is easily the most technically accomplished waterproof camcorder on the market (admittedly, this isn't a very big achievement). Equipped with plenty of consumer-friendly features and a decent still photography mode, the Sanyo Xacti VPC-CA100 is a pretty good bargain for the asking price. 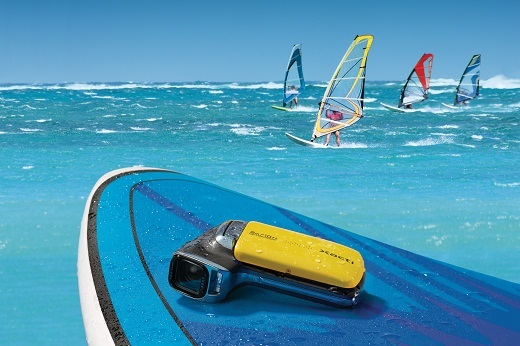 It will especially suit families looking for a go-anywhere camcorder for the holiday season. The Sanyo Xacti VPC-CA100 shares the same 'pistol-grip' design as the Sanyo Xacti VPC-CA8 (EXBK) and Sanyo Xacti VPC-CS1. 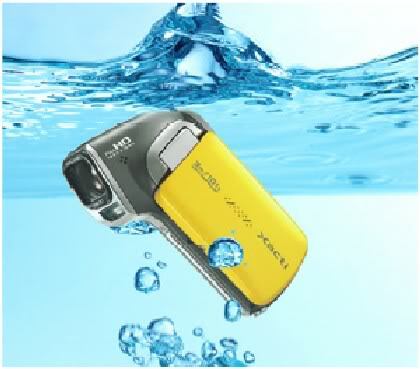 Interestingly, Sanyo's previous water-proof camcorder, the Xacti VPC-WH1, sported a traditional camcorder shape. Personally, we prefer a pistol-grip design for underwater use – it lends itself to one-handed operation more. Just make sure you keep a tight grip on it, because the Sanyo Xacti VPC-CA100 doesn't float. 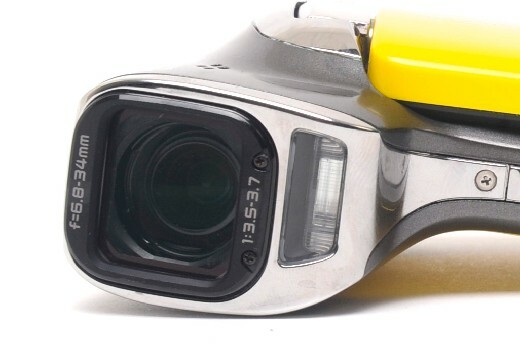 The version we tested came in a garish yellow finish, which seems to be the colour scheme of choice for waterproof camcorders. Those after a more stylish look can opt for the black Xacti VPC-CA100TABK or pink-and-silver Xacti VPC-CA100TAP. Apart from colour, all three models are identical. With dimensions of 92x123x41mm and weighing 225g, the VPC-CA100 is a little bulkier than its Xacti stable mates. Nonetheless, it will still fit inside your beach bag with minimum hassle. We were a little unenthused by the Xacti VPC-CA100's control interface. While the buttons are large and easy to find in murky water, they have a cheap, spongy feel to them. Subsequently, we were forced to continually check the 2.7in display to make sure we'd pressed hard enough: a small but annoying quirk. On the plus side, the menu interface is well laid out and easy to get to grips with. To assess the Sanyo Xacti VPC-CA100's on-land performance, we shot footage in a variety of lighting conditions before playing it back on a Pioneer KURO PDP-C509A plasma TV . Results were above average in optimum lighting conditions, although graininess did become an issue in dimmer environments. All in all, we were fairly impressed with the Sanyo VPC-CA100's video quality: while colours were somewhat inaccurate, our foootage remained sharp and attractive. As expected, results were significantly better in optimum lighting, with sharp, vibrant images awash with fine detail. In our underwater tests (conducted at the local pool), the Sanyo VPC-CA100 performed ably. The 38mm wide-angle lens captured everything in front of us, with no need to clumsily wade backwards. We would have liked to have seen a viewfinder on the unit for Macro shots and the like, but the fold-out LCD does a pretty good job of capturing the aquatic action. If you want an affordable way to shoot your children underwater (er, with a camera we mean, not a harpoon gun) the Xacti VPC-CA100 is a worthy option. As Sanyo's marketing helpfully illustrates, the Xacti VPC-CA100 doesn't float. The Sanyo Xacti VPC-CA100 comes with a decent array of inbuilt features for a sub-$600 camera. Some of the menu options on offer include face detection (up to 12 faces simultaneously), face chaser (which gives priority to a specific face), seven scene selections (Sports, Snow & Beach, etc. ), red eye correction and a handful of digital filters. The VPC-CA100’s manual modes are mostly nominal, but it’s not like you’re going to be fiddling with the exposure underwater -- simply pointing and shooting is a big enough challenge in itself. Like the rest of Sanyo's Xacti range, the VPC-CA100 is being marketed as a 'dual camera' due to its ability to capture still images. For once, this distinction might be worth making: our 14-megapixel shots actually looked pretty decent. The wide-angle lens is suitable for framing panoramic shots. (While we're on the topic os lenses, it's worth noting that the VPC-CA100 lacks a lens cover of any kind. This means you need to be extra careful about smudging or cracking the lens while the camera is not in use. The Sanyo Xacti VPC-CA100 is very attractively priced for what it offers. Indeed, $549 would be a pretty good deal even without the underwater functionality. If you require a Full HD camcorder specifically for underwater videography, the Sanyo Xacti VPC-CA100 will not disappoint.